The moving process is, for the most part, not an enjoyable one. The fact is that when it comes to moving house, it is often stressful, time-consuming and expensive. However, when the time comes to move house, you have no choice but to do so. If your family home is no longer a good fit for your family, then you have to take a leap of faith and move to somewhere new, regardless of whether you want to. The good news is that there are a few steps that you can take to reduce moving stress, make the process easier and cut costs. One of the best steps that can be taken to help reduce the stress that comes with moving is taking advantage of technology. The fact is that technology has come a long way and can be highly beneficial for making the moving process easier. Instead of house hunting in the old-fashioned way – AKA attending open house events and going from realtor to realtor, you can use resources like Open Listings to hunt for suitable properties and arrange tours of them. You can even request a virtual tour if a visit in person is not going to be possible. There are also various apps that can be used to book the right moving van and moving team for your needs. There are apps like Move, which are there to help plan your move out in detail, ensuring that no detail is overlooked or left out. There are scheduling sections and tick lists that you can take advantage of, to ensure that your move goes according to plan. There is also Sortly, an app that helps to make packing up your home easier, by showing you how to organize your items into different packing boxes. Apps like eBay and Shpock are useful for selling any old or unwanted items that you don’t need to take with you when you move. 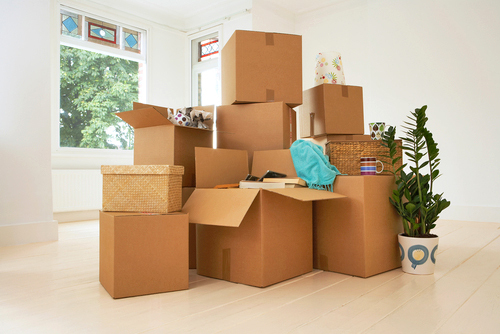 A simple step that you can take to make the moving process simpler is to overlap your move. What does this mean? It means arranging to move into your new home two weeks or so before you need to move out of your current one. That way, as long as the properties are close in distance, you have plenty of time to move all of your belongings from your old home to your new home. This also means that you don’t need to panic about getting the deep cleaning that comes with moving house done on or before moving day, as you will have a couple of weeks to get it done. While you could opt to hire a specialist service to deal with this for you, it’s much cheaper to deal with it yourself. If you don’t already have one, invest in a multi-purpose steam cleaner that can be used to clean various areas of the house, from the floors and windows to carpets and bathroom. This will come at a cost, but it will save you money in comparison to hiring a professional cleaning service and should give you the same high-quality results. This makes it a worthwhile investment to make. The truth is that there will always be an element of stress that comes with moving house, but if you are smart about your move, it does not have to overwhelm you. By taking note of the tips above, not only can you reduce the stress levels that your move causes, but also how easy and affordable the whole process is.